Anti-choice activists have succeeded in making working at an abortion clinic a terrifying, sometimes deadly experience. But as Emily Bazelon reports in the forthcoming New York Times magazine, another approach is taking shape — in university hospitals. One third of American women will have an abortion before the age of 45, but as Bazelon notes, "in 87 percent of the counties in the U.S., where a third of women live, there is no known abortion provider." 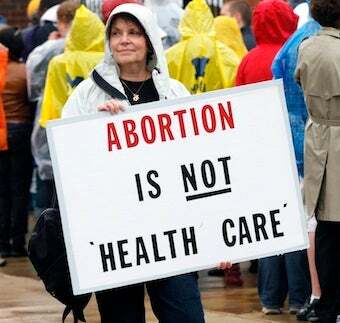 In 1973, hospitals made up 80 percent of the country's abortion facilities. By 1981, however, clinics outnumbered hospitals, and 15 years later, 90 percent of the abortions in the U.S. were performed at clinics. The experience of working at clinics is neatly illustrated when Bazelon has lunch with a Planned Parenthood provider in upstate New York and protesters wait outside the restaurant, shouting things like "Dr. Phelps, you kill babies and hurt women." Plenty of doctors are willing to offer abortions but reluctant to go through what Phelps does, so they're going a compromise route: offering abortions as part of their family practices, having been trained by relatively recent university residency and training fellowships. (A big chunk of their funding comes from Warren Buffett's now-deceased wife, Susan Thompson Buffett, and then Buffett himself. Thompson Buffett once told Charlie Rose, "Warren feels that women all over the world get shortchanged. That's why he's so pro-choice." Thanks, Warren!) They don't broadly advertise themselves as abortion providers, and many of them stick to early-term procedures. If the young doctors succeed at making abortion mainstream and respected within medicine, abortion could move from clinics to doctor's offices and hospitals. And if that happened, would the politics surrounding it finally change? Would protesters stand outside a hospital or a primary-care clinic or a group practice that treats all kinds of patients? We are a long way from that point, if it ever comes; many of the providers Bazelon interviewed declined to give their real or full names, for obvious reasons, and some of the resistance goes beyond Operation Rescue and inside the office. There is a disturbing moment where a Catholic nurse inherited by a young ob-gyn in Rochester, NY is describing the compromise they reached on abortions — which includes her referring patients to discredited, lie-promoting crisis pregnancy centers, possibly without the doctor's knowledge. Speaking of reluctant and religious medical providers, Jezebel friend Megan Carpentier notes that the Obama administration has yet to reverse a late-stage Bush rule, the so-called "provider conscience law," that "allowed nearly anyone in the medical industry to deny women access to reproductive health services — let alone referrals to alternate providers — if the professional had a religious objection to the service sought by the patient." That included not just abortions, but also access to contraception; at the very least, the Obama administration was expected to make the rule more limited. The Obama administration promised to repeal it, but has dragged its feet on the procedural details. But maybe a little pro-choice pressure will go a long way.